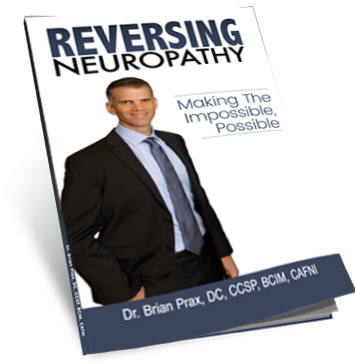 Dr. Prax “Reversing Neuropathy; Making the Impossible Possible” BOOK is OUT!!! I’m so excited that finally, after nearly 2 years, my new book, “Reversing Neuropathy; Making the Impossible Possible” is finally out. “Dr. Prax’s book describes effective modalities for treating neuropathy. Do your own research and consider Dr. Prax as an ally in your journey to good health; I did.” -Marian Pinkham; Retired M.D. This has been a labor of love and I wrote it just for you or someone you know who suffers from this terrible affliction. This will only be for a limited time until supplies run out. Now there’s a way for you to do your own self-study, and begin to reverse your neuropathy…from the comfort of your home. If you’re asking yourself this question here are the most common symptoms of this condition. 4. Difficulty grasping or holding items like cups, pens or needles. Click here to receive your copy today! Looking forward to years of health and healing! All three books are published on CreateSpace. I’m sorry to be cautious–after all, your videos clearly confirm your legitimacy–but can you explain what is going on here? Thanks for your interest JR and please let me explain. I hired an editor, who unbeknownst to me, uses content from a single source. I used his table of contents as a “skeleton” framework for my book. Nearly re-wrote the entire book. If you were to buy all three copies, you’d see the same chapter titles and some similarities but, and I promise you, my content is MINE. Kinda drove the editor crazy in that he suggested I just put my picture on it and my own title and print it. It would have been a whole lot easier and would have been done about a year ago. No way, couldn’t do it. Some of the tools we all use are the same. Electrical therapy, Infrared lights and especially diet, that is true. Here’s what I’m willing to do for you JR. Buy to book, from either source (amazon.com) or the link, and I’ll “money back guarantee” it. If you are not satisfied. I’ll refund 100% of your investment. Fair enough? Thanks for your candid reply. Dr. Brian Prax.